We had a very brief foray into the Highlands during our time in Scotland. I'd hired a guide who essentially works off TripAdvisor recommendations. He picked us up in a van right from our tiny tiny flat, and off we went with our first stop at Stirling Castle. Stirling Castle is lovely, but the location on the hill and the town below are the real highlights. The highlands are off in one direction while the fields disappear off in the others. Inside the castle, the draw for our family was The Argyll & Sutherland Highlander Regimental Museum. If it involves guns and war history, you know Nicholas is there. If it involves weird off the wall stuff, you'll find Jonathon. If it raises questions, Rebecca is interested. And if there are stories to tell, Katherine is the one reading them. So yeah. The Regimental Museum was cool. Edinburgh Castle had a great tour to see the Scottish Crown Jewels and the big rock - The Stone of Destiny. That's a mighty big title for a a flattish rock. But it is a big deal as at each coronation the stone is brought back to London to show that the new king/queen is also head of Scotland. We learned a lot about James VI of England aka James I of Scotland at Edinburgh Castle, Stirling Castle, and Westminster Abbey. We departed Stirling Castle on our way to the Highlands. The curtain of gray and mist is unmistakable as the line between here and there. On our way to our next stop we stopped to feed Highland Coos, Honey and Hamish. You know how Slimer, well, slimes people when they get too close? Well, these guys loves their carrots and turnips and potatoes, but if their tongue hits your hand you have long slimy tendrils dripping down your wrist. That's what jeans are for. If you hadn't noticed, everything is green and very muddy. After living in the Middle East for 3 years where you never have to check the weather report but maybe twice a year, in Scotland you don't really have to check the weather either but for the opposite reason. Just about every 5 minutes, the weather changes. We had so much rain. Every day. Rain. And in the highlands rain is the norm, so appreciate the sun when you see it. Highland cows are short stocky things with horns that can gore you with a shake of the head. It's a good thing there were two rows of fencing between us and them and their slimy tongues. Loch Ness is about 4 hours away from Edinburgh. Some day. Some day I will get there. But for our trip, we visited the much nearer Loch Lubnaig. Our guide challenged the family to a rock skipping contest and made a good show of it, but Nicholas was right there with him, skipping his rocks 10+ times. Most of the rest of us managed maybe 4. It was time for lunch so we headed back the way we came to Mohr Fish in Callander. A quiet and very basic seafood stop, it was just this side of quaint. No real atmosphere or anything to draw someone in, but the food was decent. Over this trip we tended to eat our weight in fish&chips and fish chowder (unless you're Rebecca or Nicholas). The Scots apparently believe that the moment you've eaten is the time to go on a hike. They seem to think that every time of every day is the right time for a hike. They love to hike. After lunch, we went on a hike. I don't recall the name of the park, though sometimes I think Scotland is one giant park, but a decent little hike led to a covered wooden bridge over a waterfall. It was here were had our mini whiskey tasting. We are not whiskey people. I won't even try with the names as I didn't take photos of the labels but I remember there were far too many consonants and not nearly enough vowels. And they were terrible. Our guide swears they were great, but my throat and belly begged to differ. One was incredibly smokey and peaty that tasted like I'd inhaled dragon breath. The other was a single malt that tasted like a burning river. The remainder of my tastes were offered to the waterfall gods. While having our tastes, the skies opened. It poured. We were under a cover, but on a schedule and who knew how long the deluge would last. It thundered. It lightninged. It was actually the lightning that made the decision for us. If we could have stayed we would have waited for the shift to a drizzle, but instead we gathered ourselves up and dove into the downpour. Up the muddy hills, through giant puddles, jeans became second skins, shoes kept the water in and not out. It was awesome. At the van the heat went on and we slowly began to dry. I mean, if you can't run through the Scottish country poorly dressed for the weather after taking in some whisky on a covered bridge by a waterfall and think it's fantastic, then you're missing out. On our way to the Loch, our guide pointed out a small and apparently dilapidated castle we passed by. It was to be our destination later in the day, and went by the name of Doune Castle. Now, we went to Doune Castle. Part of the castle was being used for a wedding as the horse and carriage outside attested to, but we visited the rest until the ceremony was over and thoroughly enjoyed the audio tour. The audio tour was narrated by Terry Jones. Just about every room in Doune Castle was used, many simply from different angles for different "rooms," in the movie Monty Python and the Holy Grail. The audio guide had options after the "history of this room" segments for Python fans to hear what scene was recorded where. This stop became, with no research prior to this tour, the highlight of Ian's trip. Not for the clumsy footed. room until I come and get 'im." Of course if you're an Outlander fan you'll recognize this castle as Castle Leoch. I managed to watch the first episode of the series on the flight to England, and then episode 2 on the return flight. It's no wonder that Scotland has caught our attention as a possibility for... what? Retirement? If a day trip like this is up your alley or even if you're just heading up Edinburgh way, we highly recommend Chris Walker (no relation to Walker shortbread) of Local Eyes Tours. It's really him doing his thing, he's not part of any big tourism program. He does walking tours of Edinburgh, day trips like ours, multi-day trips through the Highlands, you name it. He's approachable and chatty, loves to talk world politics, is engaging but steps back to let you do your own thing too. Tell him we sent you. 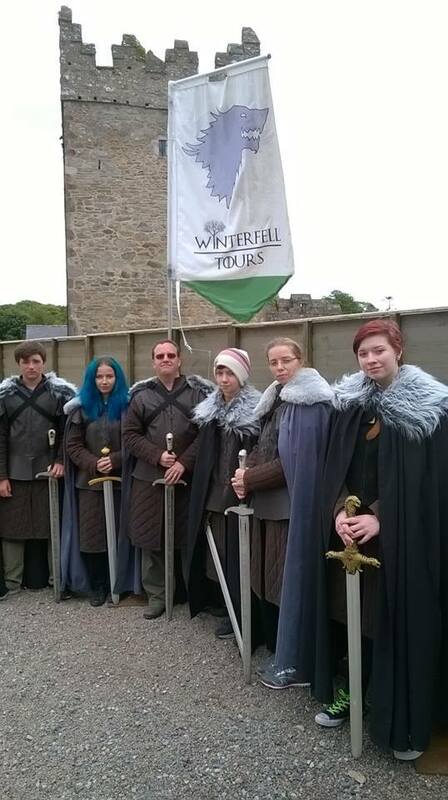 Northern Ireland is Winterfell. And the Twins. And Castle Black. And so much more. Audley's Castle. One of the Twins. One day we went out driving and geocaching and not being stalky at all, when we decided to swing by The Linen Mill studio. From the road we could see a huge ship in front of a green screen, and off to the side was a big castle structure going which looked remarkably like Castle Black. So like any good fans, we parked near by and nonchalantly walked up to the gates. It was only right at the gate that two very friendly security guards stopped us. They let us down quickly but gently when we asked if they gave tours. "Not a chance." As Ian's FB status put it: Saw a giant ship in front of green screen, and a castle in mid-build. Security guard: "I can neither confirm nor deny that that is a set. You might be undercover HBO." The kids tried at another studio. This one is right next to the Titanic Museum/Memorial. They walked across the lot and around the building until they found a door and a buzzer to ring. Another nice security guy said that No, they couldn't come in. But they did see Dothraki tents set up outside and a big boat. Photos were strictly prohibited. A sign on the fence essentially threatened bodily harm if anyone tried with a drone. The Cuan restaurant in Strangford. The Cuan has wonderful food, great staff, and GoT stalking history all its own as it's where a number of cast members ate during the first couple seasons. 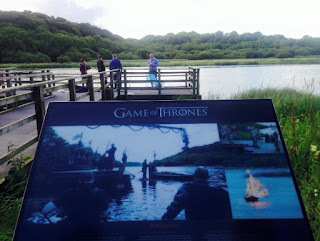 Inch Abbey - Robb Stark's camp. 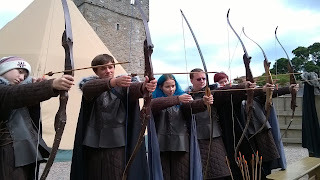 Some of us were better archers than others. 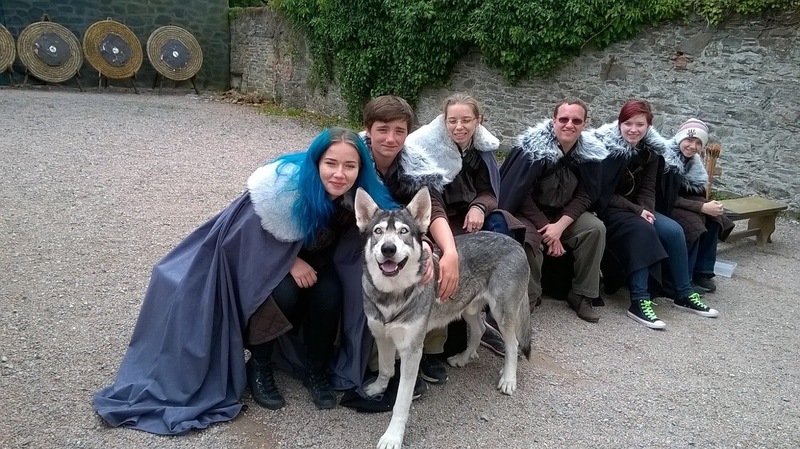 Two of the Stark pups live here with their owners. The twins (actual twins, not the buildings) told how they'd gone out for roles as extras and it was their dad who drew the director's attention. Honestly, there's a lot more that could be shared, but if you go to Winterfell it's far better to learn about it all on your own. Great stories, and of course the pups were wonderful. On our official date only one pup was available (I should stop calling them pups, they're 5 years old... though when you first saw them on screen they are the puppies pulled from the stag) but when we returned a couple days later the other was around, so William (archer and storyteller extraordinaire) remembered and let us see Odin. The dark hedges. Beautiful and very short. Wish people wouldn't park in it. Not so dark and hedgy at this end. 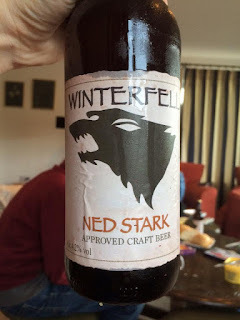 Winterfell Craft Beer. Which isn't half bad. If you're really into stalking, which we were during our time in N. Ireland, we recommend Watchers on the Wall and especially the post that mentioned Ian's tweet. It was frustrating following it and knowing that we'd missed someone here or there. For example, Kit Harington was at the Costa next to the Starbucks we went to... the next day. Emilia Clarke took photos with folks at the airport the day after we flew to Edinburgh. Ah well. Maybe we'll catch them at a Con sometime. It really is a fabulous way to see a city. We've done it in Prague (they allowed kids of pretty much any age, try finding that anywhere in the States) and Paris (just the two of us). We didn't do a Segway tour in any of the cities we visited this summer. I just thought I'd mention it if you're thinking about it. Totally fun, great way to see things. Another great way to see a new city is a free walking tour. A ton of cities have them. The catch, if you can call it a catch, is that most guides do expect some sort of tip at the end. Pay what you want. We took a walking tour in Edinburgh, but not just any tour. We took the free Potter Trail tour. If you're into Harry Potter, then you know that J.K. Rowling wrote a significant chunk of her books in Edinburgh, and she got much of her inspiration from the things and places she saw around her. My kids were split on this. Some felt that she cheated by not using her imagination more. Yes, I'm serious. Some felt that they had entered the real live Harry Potter world when walking the streets and alleys of Edinburgh. I fell into the latter group. So, tell me what this looks like to you in HP reference? favorite professor. He was notoriously bad at poetry. the spelling to allow for Voldemort's anagram. The inspiration for Diagon Alley. little nose is rubbing away and to please not touch him. Lots of people rubbed his nose anyway. He's buried in the same graveyard as Tom Riddell and McGonagall. Right near the cemetery is the school that Rowling's children attended, a definite source for how Hogwarts was run with its four houses. And every single close, or windy dark alley filled with stairs between buildings throughout Edinburgh city center, was definitely the inspiration for Knockturn Alley. Some were downright creepy. We saw a number of spots along the way where Rowling had stayed, drank coffee, and/or wrote her novels. Like I said, our family was divided. I think she took some charming and mundane bits of Edinburgh and turned them into a world full of enchantment. That's magical. And hey, I just found something else to go explore when we return to Edinburgh (sometime). Anyone visited Mary King's Close? Happy 14th Birthday Jonathon!! We love you! Too bad it had to be the first day of school! With sparklers on his cake. New shirt and a crazy sister. Loot Crate for the next 6 months! Nicholas said it was his worst birthday ever. Yeah, I said Nicholas. Jonathon got new pants (I'm always practical), some fun new socks & a variety of candy (from the grandparents), some cash (from grandparents and great grandma), and a 6 month subscription to Loot Crate (one guess who that was from). And then there were sparklers on his cake. Nicholas was greener than Jonathon's new shirt. Northern Ireland outdoors (well, most of it) is amazing. 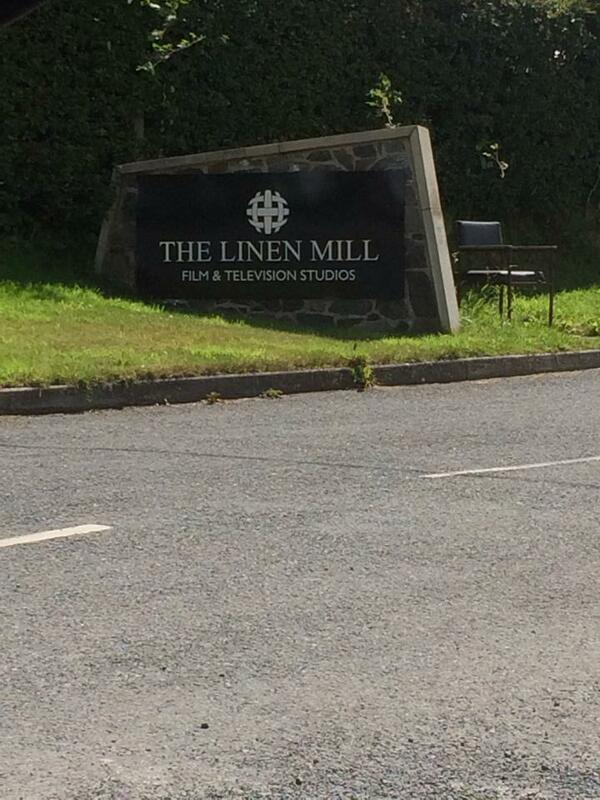 Here's the thing, Belfast is a bit of an industrial city, but it's up-and-coming. Great food, some great stuff to do, but the real gem of Northern Ireland is the countryside and the nature. If you know us, you know we pretty much hate nature, and yet N. Ireland encouraged us to love it. Except for the stinging nettles. Those can go into a hole and die as far as we're concerned. Just about all of us got stung (so... thanks geocaching X stinging nettle nature) and it's not an "ouch that hurt" sort of pain but a 12-24 hour hivey swollen stinging misery. Oh, and the spiders. Those should really just stay outside even if it rains 2 out of every 3 days and spiders don't like rain and prefer the warmth of a cozy curtain in a bedroom. Stay. Out. Side. Otherwise you will meet the bottom of Nicholas's shoe. Back to the loving... and yes, we even liked the rain. Almost all of us. That's Rebecca looking miserable at Inch Abbey (GoT: The site where Robb Stark was crowned King of the North). It probably had something to do with the shoes she was wearing that were more holes than shoe and that the field was more puddle than grass. And yes, it was still raining. Here she looks a little less miserable. I think. Next to our house, we had cows. We called that lovely guy in the back SkullFace. We rode bikes around Audley's Castle (GoT: One of the Twins), through pasture land and forest and alongside Strangford Lough. So, no question we don't really like nature. What we discovered is that Ian really doesn't like bike riding. At all. Even more than his dislike of nature. We did two separate circuits and for the first (through the fields and pasture) all 6 of us rode. For the second, only 5 of us went out. Ian would have none of it. Truth be told, Rebecca didn't enjoy the first round either but took on the second and found it much more enjoyable. Though the area was described as "flat" and "good for families" even the smallest of inclines proved challenging for our non-bike-riding family. But you know what? It was still tons of fun. Even if we did walk up most of the hills. And look what else we found? Cute story. When we arrived in Edinburgh, we met up with another Embassy Amman family who we happened to cross vacation paths with. At lunch, we learned that their 3-year old daughter was fascinated with Nessie. We pulled up this photo on the camera and showed her that Nessie was in fact real and was vacationing in N. Ireland which is why they hadn't seen her in Scotland. My favorite take-away from this trip was a sign I saw in some shop: There's no such thing as poor weather, only poor choice of clothing. It's absolutely true. It's also good to remember up north that it's going to rain whether you go out and do fun stuff or not, so you might as well go do it and have fun. It makes the best stories when your activities are just this side of uncomfortable or chaotic. For this trip, we were soggy more times than I can count, and survived. We missed the 110F and massive duststorm in Amman in exchange for 65F with rain every day, and it was awesome.